It’s Carly B. Just thought I’d fill you in on some of the stuff we’ve been up to during the past couple of months and some exciting new happenings on the horizon. First up, I need to tell you a little about our recent gig in Lebanon, which took place on December 22nd, 2011 at the massive Forum De Beiruthe venue in Beirut. Beirut is an amazing city to visit and the people were so welcoming and friendly. We got to play to an appreciative audience consisting of 5,000 screaming Floyd fans and I think I can speak for everyone when I say this was certainly one of the most enjoyable shows from last year. A significant highlight of the night was when 5,000 Lebanese Floyd fans launched into singing ‘Happy Birthday’ to Bobby. You may have noticed that our US and Canada tour is shaping up nicely. We kick off at the Benedum Center in Pittsburgh (PA) with a sold out show on 23rd February. 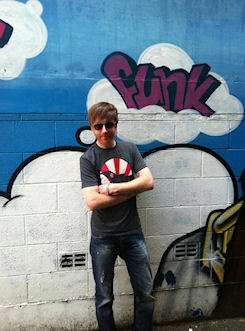 The tour then takes in venues across the East Coast before heading up into Canada. We’re all very excited about returning over the pond with our new show celebrating Pink Floyd’s recent release ‘A Foot in the Door’. We’re also booked to play the prestigious Red Rocks Amphitheatre in Colorado on 28th September. There’s a real buzz about this gig as we will be playing a 10,000 seat venue located in the Rocky Mountains as well as following in the footsteps of some amazing bands. The third and final leg of Brit Floyd’s 2011 European Tour! Germany has been fantastic, and the crowds have been awesome! Thank you to everyone for making every night so enjoyable for us, and the quick trip over to Belgium was also a pleasure. 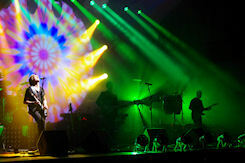 Read more: The third and final leg of Brit Floyd’s 2011 European Tour! We hope you all had a fantastic summer, wherever you are. It looks like they’ve decided to start summer in late September, here in the UK, just as the Brit Floyd guys and girls are set to embark on our first European tour. We’re extremely excited about this tour, which kicks off at the Konserthus in Oslo on October 7th. 32 dates have been confirmed so far, covering nine countries including Norway, Sweden, Denmark, Germany, Belgium, Luxembourg, France, Holland and my old stomping ground, Switzerland. Damian, Ian, Carl, Emily, Rob, Ola, Jacquie, Arran, Rick, myself and of course, our fantastic crew are all really looking forward to giving our European friends a Floyd fix! Thanks so much, once again, to everybody who made it to one of our UK dates this year. Your support, as ever, is greatly appreciated and we look forward to seeing you again soon. My personal highlights from the 2011 UK tour include London’s Royal Albert Hall and O2 Arena, the three shows at Liverpool Echo Arena, plus the festival dates at Glastonbury and The Isle Of Wight, but I enjoyed every gig. The crowds were fantastic and each venue in each city offered something new and exciting.